Google has finally added a new feature to automatically recognize addresses, phone numbers and contacts and convert them to clickable links on Gmail services on the web as well as the mobile app. This is rather coming late being that most other email services already have the feature for years now. 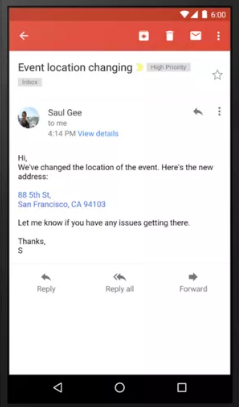 Android and iOS have actually had phone number linking for a while through an OS level function, but the rest of it (including phone numbers on web) are totally new to Gmail, at least in Google’s native software. From September, 2017 contents of Gmail that follows a particular format will be automatically converted to clickable links and it will open using the devices default app and services. Click on a street address? It’ll open in Google Maps. Click on Email address? A compose window for a new email. Same for Phone number? It’ll open the default dialer on your device to make a call. This is rather unusual for Google playing catch up to such an obvious feature but it better late than never.